Features 13 Ports of connectivity: USB 3.1 Gen 1, Thunderbolt 3, FireWire 800, SD Reader, miniDisplay Port, Gigabit Ethernet, S/PDIF, Audio I/O. With the 13 ports you need, OWC's new Thunderbolt 3 Dock brings unbelievable connectivity to your laptop through an included Thunderbolt 3 cable, and, delivers charging power to your laptop and other devices, all at the fastest speeds possible. OWC's Thunderbolt 3 Dock delivers more connectivity, more power, and charging capability than ever before all at the fastest speed available today so all your connected devices perform at their maximum. Drive two 4K displays, connect and charge up to six USB devices, work with legacy FireWire storage, enjoy pristine audio, wired networks, and read SD cards, all at twice the speed of Thunderbolt 2 and all through a single cable. The possibilities are endless. 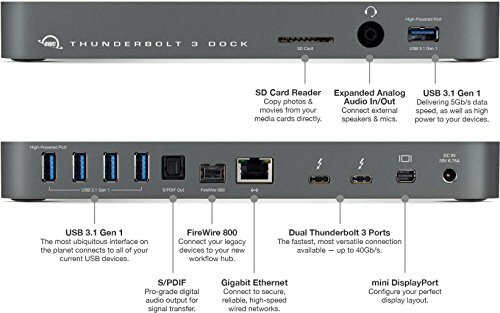 Because Thunderbolt 3 delivers phenomenal bandwidth, up to 40Gb/s, Thunderbolt 3 Dock can be the foundation of your perfect custom display setup. Providing the ability to drive the latest generation 5K displays, two ultra HD 4K displays, or a combination of 4K, HD and other displays with the mini DisplayPort port and additional Thunderbolt 3 port. If you're a pro working in the creative industries, you probably have a highly specialized workflow complete with specialized and legacy ports like FireWire and digital audio. The OWC Thunderbolt 3 Dock supports FW800 and S/PDIF digital audio, as well as an SD card reader and analog stereo audio. OWC connectivity solutions are engineered to demanding quality standards in order to deliver the most reliable, highest performance available on the market. OWC offers a superior level of support and a 2 year warranty coverage to our customers.